Good morning campers! It's the weekend, which means it's prime time for me to stage a hostile takeover guest-host the first weekend Daily Doodle of 2006. You've got until midnight (pirate time) Sunday for this doodle. General rules will apply. Many times this year, I've read the forums and found myself wondering what exactly some of you have eaten for breakfast that's inspired you to post what you did. Personally, I enjoy warm, crunchy toast. And I know I'm not the only one who likes toast. Some people love toast so much they claim to see things in their toast. 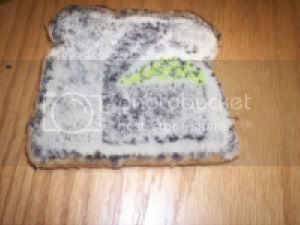 And they then sell these pieces of toast on eBay for ridiculous amounts of money to another toast lover. See where I'm going with this? I'd like to know what piratey visions you guys see in your toast. So that's your challenge for the weekend. Make toast. But not just any toast. I know, you're thinking that 2 days isn't enough time. 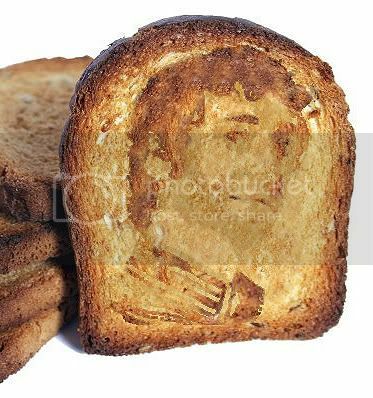 These mysterious toast images don't just appear to anyone, and there's no guarantee that they'll happen this weekend. So you have my permission to "encourage" these images to come out, in fact, that's exactly what I'd like you to do. 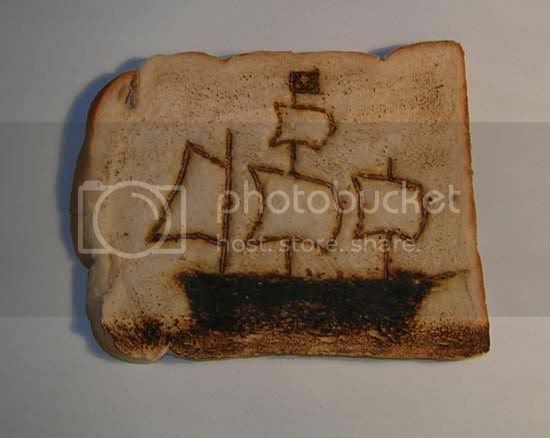 You should start with one piece of bread, and create your masterpiece either pre or post-toasting and then take a picture of it and post it (or a link) here in this thread along with your pirate name and ocean. One slice per pirate, please. 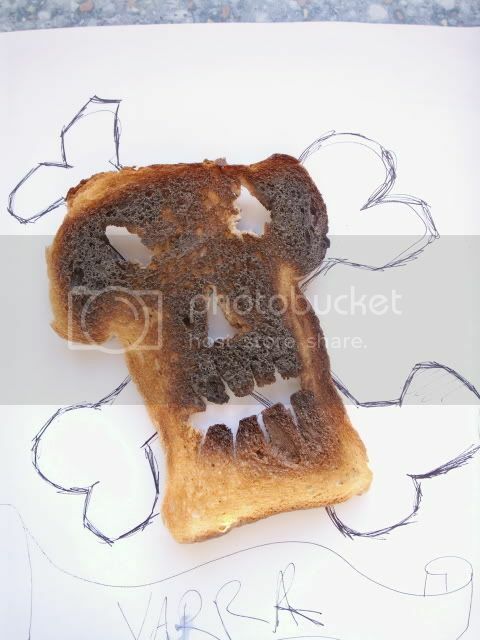 How can you create a piratey toast masterpiece? Here is a handy guide to a method involving butter. You could build a Zuse. You could also try imprinting or stamping something into your bread before toasting, like this device. Or you could use food coloring, strategically scrape off burnt parts, or whatever else works for you. Surprise me. It would be nice if the toast is still edible, but it's not mandatory. An explanatory note: The linked references are not meant to offend or be blasphemous in any way. These just happened to be the best examples. A cautionary note: Do be careful, and do not do anything that could cause harm or burnination to yourself or others. Do not put anything in your toaster that does not belong there. Fire bad. Can i make something like the pyramid of toast(large pile of toast making a pyramid)? Can I make puzzle toast??? etc..?? Glaucus, should we specify if our entry is digitally made or home-made? I can definitely see a reason for knowing if the toast was made through a paint type program versus the real thing. Good way to get my coocking skills up (and creativity ^^)! Little bit of dark apple butter, a dab of strawberry jelly..
TA DA!... My Red Monkey ON TOAST! I swear I put it in the original post, but in case it's not clear, One slice of bread only, please. If you want to take it apart to make a pyramid or something else, I suppose you could. If you've already made something with multiple pieces of bread, post it somewhere else so I can admire it! Aye, I'm aware bread is broad term. I would strongly prefer the more conventional stuff, so I believe ciabatta would qualify, but croissants are pretty iffy. Less questions, more toast! Speaking of which, I'm hungry. In Mariner's Muse, Mate. That's where all things arrrrtsy and creative arrr posted. Glaucus, can you confirm something for me? I was at the store last night, and in the bakery section [wooo, bread! ], I found like the coolest bread ever. However, I didn't know if just taking a loaf of french and cutting it lengthwise would still qualify as a "slice of toast". Errr... example. (------------) <-- a very bad loaf of bread, but still. If I cut on the line and used all that for my scene, yes, no, disqualified? 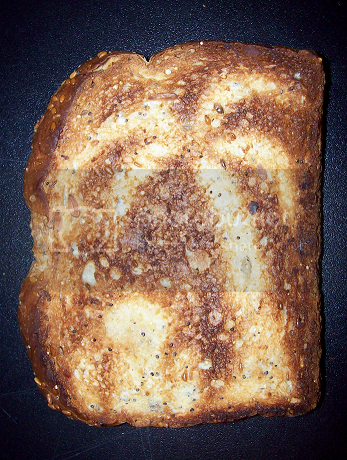 When I woke up this afternoon, the last thing I expected was the find a message in my toast. But there it was! All white and outlined in brown.. I knew it could only mean one thing: Glaucus was thinking about breakfast. Cleaver says, "I'll be toast, just you watch." Cleaver says, "Let me make a decent sword." Feel like a space adventure? Ok so after my masterpiece ( http://forums.puzzlepirates.com/community/mvnforum/viewthread?thread=3449&offset=560 ) i was quite disappointed i couldnt use it, and couldnt even think of something to do for a single slice. But with what little time, imagination and bread i hadn't already used up i managed to come up with something.. So i got a hook after some sinky sinky fun... would rather of had an eye-patch and only being human was slightly disappointed. I never thought the ungreatfullness would come back and haunt me though! And not only in my dreams.... but after i woke too!! So I present to you attempt #4, and believe you me there is no digital enhancement here!! Deer season hell, I'm waiting for stupid season to open. Frejja, back on the seven seas! I give you CRABBY TOAST! ^.^ I feel certifiably insane 'bout now for branding my toast but heh, all in good fun. This was crazily hard to do, and being a person who hates waste - I seem to have lived on toast all day. We are half a loaf poorer! Ring the bells that still can ring, Forget your perfect offering. but.. beware of teh bitter taste because the monkey's burned. I toasted this yesterday morning, but I couldn't get to my dad's digital camera until now. Oh, and no digital trickery was involved in the production of this picture.